One ant two ants, three ants four. by the curb side, see? 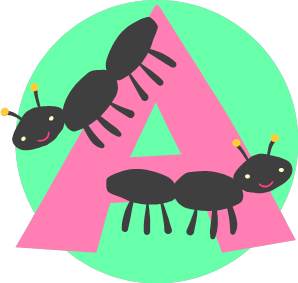 Sung to: "When John Comes Marching Home"
So I said, "Dear little ants, won't you come out?" Oh, the ants are busy! Sung to: "She'll Be Coming Round The Mountain"
Oh, the ants are busy, busy as can be. See them dig and dig and dig. Lots of tunnels, oh, so big.